The Republic of Altai is located in Central Asia and borders on Kazakhstan, China and Mongolia. It is comparable in size with Portugal. The region is dominated by mountains with eternal snow and glaciers, similar to the European Alps. The highest peak, Ak-Sümer, is 4'506 metres (nearly 15'000 feet) high. Altai has a population of about 200'000 souls of various nationalities: Altais, Russians and Germans. The Turkish peoples in Altai were hunters and nomadic shepherds tending sheep, horses and sometimes camels. The bequeathed an extremely interesting culture to their descendants, the basic features of which have been handed down from the early beginnings all the way to the present day. One of the most important forms of Altai art, apart from painting and poetry, is the narration of epics in the falsetto voice to the accompaniment of the topshur, a lute-like string instrument. Texts are usually enunciated in the low bass register. These narratives enjoyed great popularity amongst the people of the steppes. One of the legendary narrators, Deley, knew 77 of them by heart and the longest took seven days and nights. Altai has produced a number of masters of this art, such as N. Ulagashev and P. Kutshiyak and today the tradition is still kept alive by such people as Aleksey Kalkin, S. Aetenov, Shunu Yalatov, Tovar Tchetsiyakov and Tanishpai Shinshin. They preserve a traditional heritage of popular literature and sing of their secret dreams and expectations. These epics contain the aesthetic ideas of this nation in its truest form of expression and tell of the everyday world and the world of spirits and myths. Most of them are pentatonic and melismatics play an important role in the development of the melodies. There are songs of congratulations, for each of the seasons, lullabies, songs for all sorts of animals and even insects, songs of travel, modern philosophical songs, ballads, and improvisations. Many are a kind of oral philosophy and, at the same time, textbooks designed to guide mankind to a higher level of consciousness. With "Üch Sümer", a first album is now appearing with two folk-singers from Altai. Bolot Bayrishev and Nohon Shumarov sing of the beauty of their homeland Altai, of the "golden lakes", the Katun River, the Ak-Sümer (the highest peak in the Altai mountains), and the old "Pazyryk" - these are the hill graves where the defenders of the Altai are buried. Then they sing of their people, small though it is in number, and of mankind, Nature, the cosmos, and the entity they all form. They open the hidden depths of their souls and combine poetry with music. One of the oldest legends of these inhabitants of the Altai tells of the origin of the Turkish tribe of Rükü, which is even chronicled in China. The Rükü lived in the southern Altai in the 5th century and mined iron ore. They consisted of 70 brothers, the oldest of whom had been born by a wolf and ruled over the winds and granted blessings. He even had power over summer and winter. 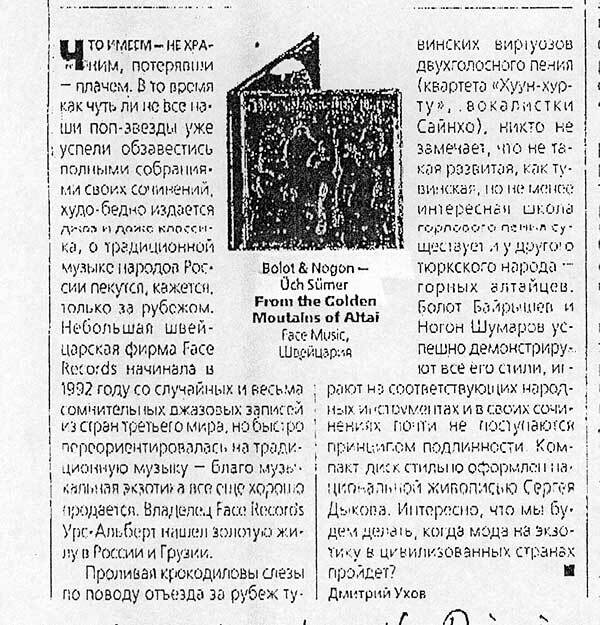 latest CD: "FM 50018 - Üch Sümer" - "FM 50020 - Altai Maktal"
Nikolai Shumarov, known as Nohon, born on 9th July 1947 in Yaman, a small village in the Altai mountains, attended the College of Art in Novosibirsk for three years and then worked as an actor for a year in the Theater of Dramatic Art. He then went on to study in St. Petersburg at the Academy for Theater, Music and Cinema for five long years. From 1977 onwards he was the theater producer in charge of an ensemble of 30 performers in Gorno Altaysk, the capital city of the Republic of Altai, in southern Siberia. Material is presented there from the traditional folk art of the Altaiic origin, Kirgiz, and Bashkirs, as well as from Japan, Russia, and Moldavia. Nohon has also written plays of his own and composed the music for them. At the age of 30 he discovered his love for traditional and folk art. He says: "My people are my gold". Nohon now works and teaches overtone-singing at the School of Classical Music. This is the only school in the Altai to work with traditional music. Nohon works on the folklore of his home, including works by such people as Aleksey Kalkin, Tovar Tchetsiyakov, and Tanishpai Shinshin, and tries to preserve the creative heritage as well as produce new work to suit modern times. Nohon has also directed the opera and ballet productions of "Talai-Khan", "Oerlik-Khan", and "Khan-Altai" together with L.V. Anochin, collaborated with the modern composer Zofia Gubaidulina, and produced a multi-spectacle with music and film together with Valentina Ponomareva which was given its first performance in Moscow. The stage is the place where he presents the message from his home and his roots in the Altai. Nohon has given guest performances in Tuva, Mongolia, the Urals (Bashkiria), Kirgizstan, Uzbekistan, Kazakhstan, Vietnam, Lithuania, and Latvia, and in such major Russian cities as Moscow, St. Petersburg, Omsk, and Novosibirsk. Nohon traveled through Germany for three months with the Southern Siberian regional Theater and Music Ensemble, presenting the play "White Reindeer" at festivals in the cities of Berlin, Dresden, Hamburg, Husum, Mannheim, Freiburg, Kassel, and many others. 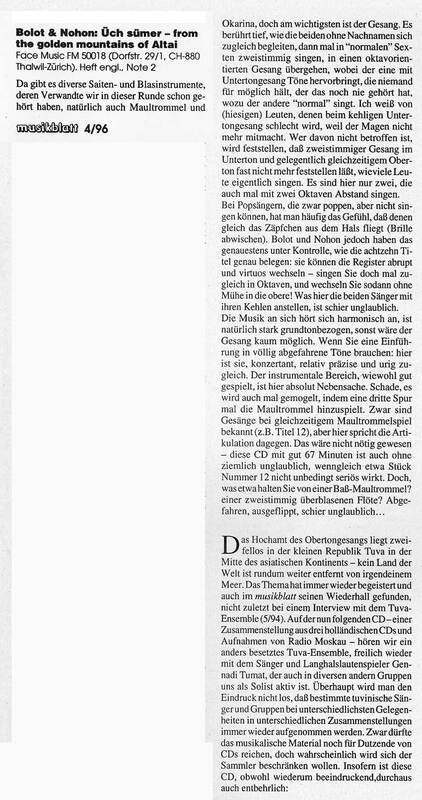 In 1996 he went on tour with Bolot Bayrichev and Sarmai in Germany, Austria, Switzerland, and Slovenia. 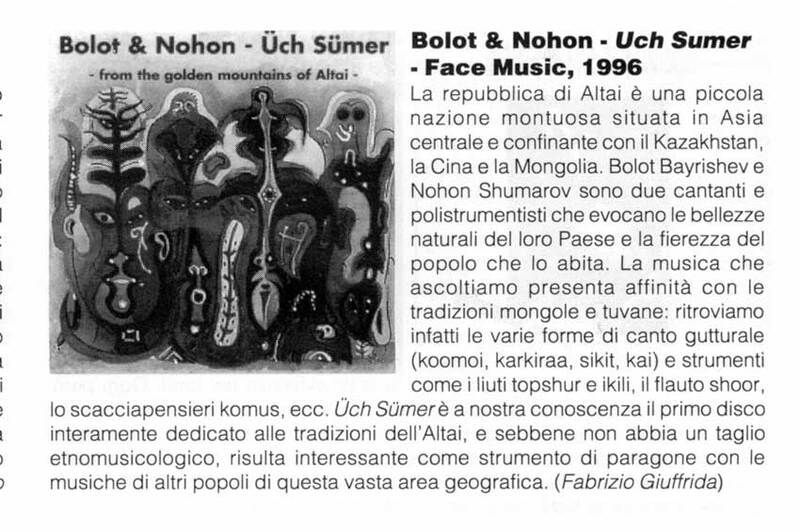 1996 - Üch Sümer, first CD with Face Music, Switzerland. 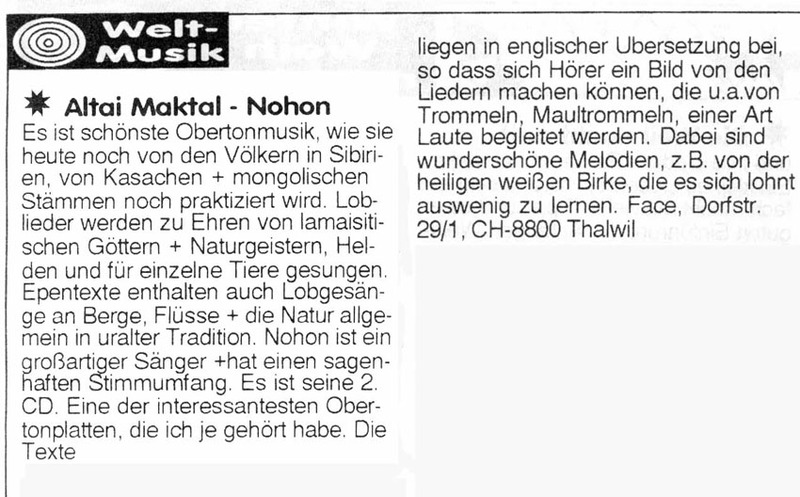 2000 - Altai Maktal, second CD with Face Music, Switzerland.